More articles about Muhammad Ali. Muhammad Ali’s death in June was a reminder of what a brilliant muse he was, especially to photographers. He told us he was pretty, and he was right. But he was more than that. As images from his half-century of renown revealed anew, he had created an astonishing canvas simply by smiling, or by flicking a jab, preaching at a mosque, hitting the speed bag, glistening with sweat, rejecting entry into the military, goofing with the Beatles, screaming in mock-lunacy at Sonny Liston, taunting Joe Frazier and rope-a-doping with George Foreman. He rarely seemed to be offstage — or to take a bad picture. 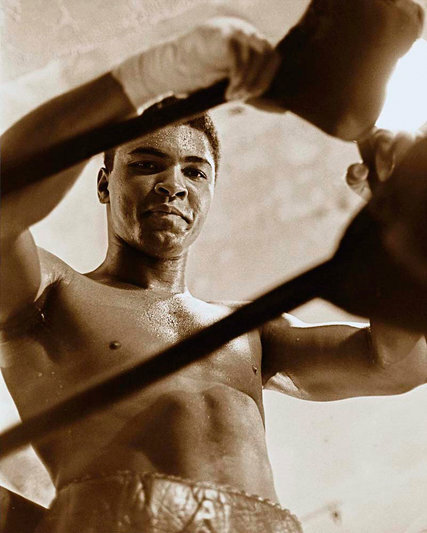 Ali’s attractiveness as an artistic subject is being explored in a pair of animated exhibitions at the New-York Historical Society: the Ali photographs by George Kalinsky, the official photographer of Madison Square Garden, and the watercolors and sketches of Ali by the idiosyncratic artist LeRoy Neiman. While the works by Mr. Kalinsky and Mr. Neiman examine similar times in Ali’s life, they are vastly different. The images in “‘I Am King of the World’: Photographs of Muhammad Ali by George Kalinsky” are mostly black and white. 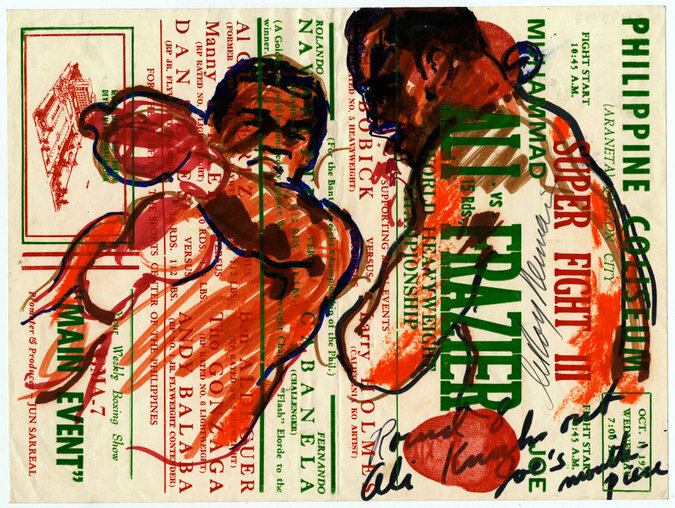 Mr. Neiman’s Impressionistic paintings in “Muhammad Ali, LeRoy Neiman, and the Art of Boxing” are brilliantly colored, some dashed off quickly, as if he were trying to catch up to the immediacy of a photograph, or a punch. These two artists were close friends for about 50 years, but were as different as their artistry: Mr. Kalinsky is low-key and soft-spoken. Mr. Neiman, who died in 2012, was a boldface personality and self-made celebrity who painted and sketched on live television. And he often tried to encourage Mr. Kalinsky to be a bit flamboyant. Mr. Neiman created the invitations to Mr. Kalinsky’s wedding in 1998, and sketched as he and his bride, June Azoulay, walked down the aisle. Mr. Neiman wore white. Their careers were rooted, in part, by their fascination with Ali and boxing. Mr. Neiman met the fighter first, in 1962, in the dressing room of St. Nicholas Arena in Manhattan, where the brash 20-year-old was about to fight Billy Daniels. Mr. Neiman was sketching Ali, contemplative, with his hands taped and about to have his gloves fitted. The curious boxer grabbed the sketchbook. Ali won when Liston failed to answer the bell for the seventh round. Mr. Kalinsky began photographing Ali in 1965, the year after he captured the heavyweight title from Liston. 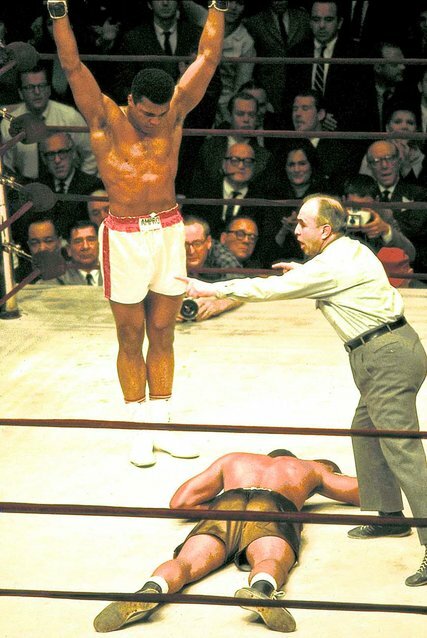 More than 40 of Mr. Kalinsky’s pictures are in the show — shots of Ali in the ring, in training, driving a busload of reporters, sleeping, clowning and completing the pictures in a military coloring book the year he refused induction. “The very first foot of film I ever took as a professional was of him working out in Miami in 1965,” said Mr. Kalinsky, who parlayed pictures from that training session into his job at the Garden. One day in 1976, Mr. Kalinsky and Mr. Neiman were in the back of a station wagon in the Catskills at 4 a.m. as Ali ran behind them, training for his third fight against Ken Norton. Mr. Neiman was sketching and Mr. Kalinsky shooting. New-York Historical Society: the Ali photographs by George Kalinsky, the official photographer of Madison Square Garden, and the watercolors and sketches of Ali by the idiosyncratic artist LeRoy Neiman.